John F. Kennedy, our 35th President, was born into a powerhouse family. His father, Joseph Kennedy, was a successful and very wealthy businessman. Joseph and his wife, Rose, had nine children. Joseph had plans for each of his sons. The eldest, Joe, was destined for politics. John would become a writer and teacher. When Joe died fighting in World War II, John changed his career path and ran for offices in the House of Representatives and Senate. He lost his first bid for vice-president, but was nominated for President a few years later. His whole family pitched in to help him win the election, traveling and making speeches all over the country. As President, Kennedy worked hard to end racism and improve civil rights laws. He established the Peace Corps and prevented Russia from placing nuclear missiles in Cuba – where they could easily hit U.S. cities. While traveling in a convertible on his way to deliver a speech in Dallas, Texas, Kennedy was shot by an assassin as he sat next to his wife. The country and world mourned his death. He was 46-years-old. John F. Kennedy was born May 29, 1917 in Brookline, Massachusetts. His family was Catholic. Kennedy joined the Navy during World War II. He was a skipper on a small boat in the South Pacific Ocean. One night, a Japanese destroyer charged the boat, cutting it in half. Two men were killed and Kennedy was badly injured. He swam for five hours, towing another injured man by clenching the man’s life jacket strap in his teeth. Finally, they reached an island. Kennedy married Jacqueline Lee Bouvier in 1953. They had three children, Caroline, John, and a son who died in childhood. Jacqueline Kennedy was beautiful, charming, and wealthy. She brought a new sense of style to the White House. People admired her clothing and her pill-box hats. Jacqueline hired a French chef in the White House, but John preferred simple dishes like fish chowder. Kennedy had a short attention span. He often conducted meetings in the hall, keeping them short and to the point. Question: Who killed President Kennedy? Answer: One gunman, Lee Harvey Oswald, was arrested, but he was murdered before his trial. Some people wonder if other people were involved in Kennedy’s assassination. Nobody knows for sure. Visit the JFK library to learn more. Declan, Tobin. " 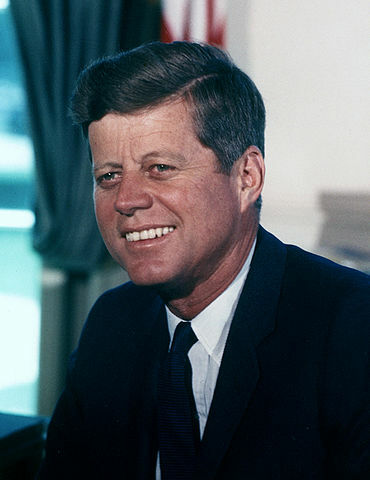 John F. Kennedy Facts for Kids ." Easy Science for Kids, Apr 2019. Web. 24 Apr 2019. < https://easyscienceforkids.com/john-f-kennedy/ >.